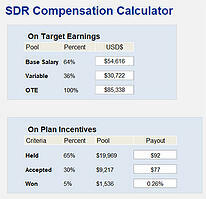 Based on our SDR research, this calculator provides OTE and variable compensation data for those reps chartered with "setting introductory appointments" or "generating qualified opportunities." The calculator takes into account your average sales price, hiring profile, role specifics, and geography. (Note: US only).